Ventile was developed during World War II to protect the lives of the Royal Air Force pilots when they were forced to bail out over the icy waters of the North Atlantic. Ventile fabric was extremely effective in many ways; cool and comfortable in the cockpit yet warm and impenetrable in the icy waters. Since that time, the fabric has not changed and at Evarts & Jordan, we have experienced its unbelievable advantages. Ventile is warm, windproof and weatherproof. Any garment constructed with two layers of Ventile becomes waterproof, even in the toughest of conditions. The fabric is impenetrable, even when confronted with the sharpest briars. Made from the finest, long staple cottons, and not coated or laminated in any way, it is a natural fabric that breathes far more effectively than any other fabric we have ever seen. 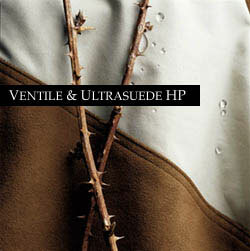 UltrasuedeHP is breathable, stain resistant, pliable, washable and spot cleanable. Most important, it is the toughest fabric we have ever found yet it offers a soft, sumptuous nap. The fabric feels great and is extremely comfortable to wear. How tough is this fabric? Composed of micro-fine blended fibers, arranged in a dense, non woven configuration, it was engineered for unequaled strength and long life. HP passes 200,000 double rubs on the Wyzenbeek tester-more than ten times the industry standard for abrasion resistance. Briars, thorns, and prickly pears are all turned away with ease. It resists all fraying, which is why we have bound several of our garments with it, including the hem of our briar pants. Highly water repellent, this fabric's performance is truly superior. For the first time ever in the industry, we are proud to present such a trustworthy and dependable fabric.